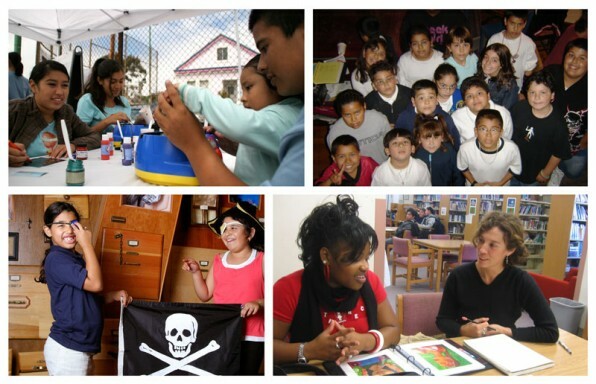 Our main goals are to close the academic achievement gap for under-served youth in the Bay Area, provide the tools and resources necessary for success in school and beyond, connect caring adults to young people in need of individualized support, and make the path to college and career less of a leap. With this in mind, we offer a range of programs, all free of charge, for students, classrooms, and schools in the Bay Area. Our project-based approach allows students ownership over the writing process and strengthens their ability to express themselves clearly and in their own voice. By making writing fun, by demystifying the process, and by creating gorgeous books, magazines, and newspapers that honor their work, we can inspire young people to gain critical skills and write with confidence. For a more in-depth look at our recent programs, check out our 2013-2014 annual report. 826 Valencia was founded in 2002 by author Dave Eggers and educator Nínive Calegari. Read more about the history of the organization. Dave Eggers also tells the story about 826’s inspiration, early beginnings, and ensuing momentum in a TED Talks video. We encourage you to check out the finest Pirate Supply Store in San Francisco, which is the storefront to our writing center and supports our nonprofit. Stay up to date with 826 Valencia by following us on Facebook and Twitter. Read about who we are and what we do via a snapshot of a year’s worth of programming and publishing, in our center and at our partner schools, all made possible by our dedicated community of volunteers and supporters. You’ll also find projections, goals, and exciting news for the year to come. Read the 2013–2014 Annual Report here. Planning a visit to 826 Valencia? Our storefront is open to visitors from 12 to 6 p.m. every day of the week, except holidays. Whether you have questions about giant squid or tutoring kids, our Pirate Supply Store staff can answer your questions.